Scott has a history of hard work and happy clients. His clients often write reviews and testimonials for the office. Below are some excerpts from client testimonials. Scott [has] a great ability to make you feel comfortable with them and confident that they can help you make your problems go away. I highly recommend [him] if you need an attorney. -Gabriel F.
Thanks to your excellent work and extensive knowledge I had a very successful outcome with my cases… I really can’t thank you guys enough, there is no doubt in my mind that you guys are the BEST! I could not have done it without you guys!… I highly recommend them to anyone who should need legal help. -Brandon F.
Mr. Kimberly took my case very seriously! He was very honest and truthful with providing ALL the pros’ and cons’ of my case. I was well informed of each document being drawn up and step Mr. Kimberly took involving my case!… And he got the JOB DONE!! Thank YOU SIR!!! -Bernard B.
I’m the luckiest woman in the world to have found Scott. I met him at the legal clinic and it was just by chance that I was able meet him. From the first day, he was very knowledgeable and helpful. He’s excellent in every aspect and “tells it like it is”, which is sometimes hard to hear, but what I needed. I was well informed throughout the case, and he explained the law in a clear way. I’m happy with everything. He went above and beyond what I believe any other attorney would have done for me. I’m the luckiest person in the world to have found such a great attorney. His knowledge and professionalism is exceptional. Mr. Kimberly has gone above and beyond my expectations. He truly cares about his clients and I would highly recommend him to anyone needing legal help. I went to him from a referral and I couldn’t be happier with the outcome. Thank you so much for all of your help. I not only consider him my attorney but also my friend. Its rare to find an attorney that truly cares for his clients. I cannot thank him enough! A friend of mine had hired Mr. Kimberly and was very happy with the outcome of her case. As I accompanied my friend to her appointments with Mr. Kimberly, I thought to myself that she was in good hands with him. His empathy and professionalism was very evident. Little did I know that a about a year later I would also be in search of a qualified attorney and Scott Kimberly was the only name I needed. In a very unsure and trying time in my life, Mr. Kimberly provided a realistic understanding and provided me with the confidence to know that everything would be okay. Mr. Kimberly is a highly qualified attorney that will work hard to answer any question you have, even if you ask it ten times over. He is diligent and passionate about the work he does and the clients he works for. 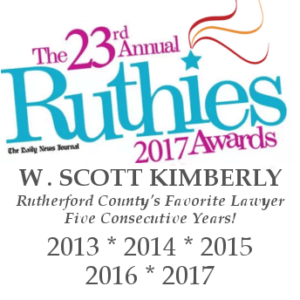 I don’t think I would have gotten through what I did without Scott Kimberly on my side. Scott is a really great attorney, but more importantly a great guy. If you have criminal or family law issues, call Scott!